Our big metropolitan cities have become hugely diverse. Even in rural areas like Cambridgeshire, public services are struggling to cope with increasing levels of migration and diversity. The police service no longer reflects the communities it serves mainly because it failed to recruit from these diverse communities as migrating populations increased. This has become particularly critical because data shows that minority ethnic communities in particular are disproportionately affected in all walks of life from education to socio-economic opportunities. Policing is no different and this disproportionality is reflected in stop and search, internal and external complaints, missed career opportunities and misconduct. 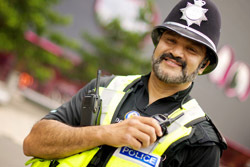 I have worked in West Midlands Police as the D&I lead for 10 years and rarely have I seen a level of acceptable satisfaction, either qualitative or quantitative, from the black or minority ethnic (BAME) groups employed. In fact, a survey I ran in 2013 showed BAME respondent’s felt less valued and included than their white counterparts. The business case for D&I is clear that a more diverse and inclusive workforce outperforms those that aren’t. It has long been suspected by the BAME workers in WMP that there are systematic and unconscious biases that place unnecessary barriers in the way of achieving a fully inclusive culture. Programmes to make officers aware of their unconscious biases have emerged but there is no concrete evidence to show that this has had any positive impact on culture and behaviour. My view which reflects Harvard University research is that the only way to change behaviour is to systematically remove the ability for people to manifest their biases. Doing so raises the levels of confidence that BAME colleagues, community and applicants have in the service. There are both real and perceived biases, for example when I speak to potential applicants they tell me that Muslim female officers cannot wear the Hijab or that the police shoot black males. Despite both being myths these are genuine beliefs exacerbated by the media, especially social media that has no national boundaries. It is also compounded through ill-informed bigotry peddled by some in positions of power and influence to create a divided society. Removing systematic bias and attracting diverse applicants who can offer the service cultural competencies and access to communities is critical and one of the most important priorities for the police service.